American Film Institute founder George Stevens (L) and Librarian of Congress Carla Hayden are seen at an event in Washington marking 50 years of partnership in film preservation between the two institutions. In a star-studded night in Washington, the American Film Institute and the Library of Congress celebrated 50 years of partnership in film preservation. Actor Morgan Freeman, American Film Institute founder George Stevens and House Minority Leader Nancy Pelosi were among the celebrities honoring half a century of partnership between the AFI and the Library of Congress. 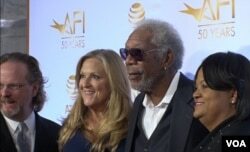 “I think the AFI is important to all of us because its number one goal is the preservation of American film,” said Academy Award winner Freeman. He attended the event as a representative of the American Film Institute. When the AFI began its preservation process in 1967, less than 1/10th of the American films made in the early 20th century had survived, says George Stevens, the Institute's founder. "Working with the Library of Congress, we did a great search and rescue operation and recovered films. The Library has reproduced them in safety film stock, so now, there are 37,000 motion pictures in the AFI Collection here at the Library of Congress," he said proudly. Stevens started his painstaking film preservation process when he was in Washington, D.C., working at the U.S. Information Agency, VOA's parent agency at the time. He worked under U.S. broadcast journalist Edward R. Murrow. “I ran the motion picture division and worked with my colleague John Chancellor and Henry Loomis, who ran the Voice of America. So, I am a former part of your family,“ he said with a smile. Apart from the AFI Collection, hundreds of thousands of other old films are stored at the Library of Congress facility in Culpeper, Virginia. This is an ongoing preservation process, says the Librarian of Congress, Carla Hayden, the first woman to hold the post in 60 years. Library of Congress Nitrate Film Vault manager George Willeman handles a disintegrating spool of film. Actor Morgan Freeman (2-R) is seen in a group photo with guests attending an event marking 50 years of joint film preservation efforts between the American Film Institute and the Libary of Congress. After the end of the Cold War, the space was sold to the Library of Congress. With the help of philanthropist David Packard, the Library enhanced the underground space and built the Packard Campus to accommodate its ever-increasing film collection. But George Willeman says digital preservation may be an oxymoron.